CrystalDB Tool provides database management functionalities which includes editing table data, creating or altering tables and views as well as database objects, backup and restore database etc. CrystalDB Tool allows the user to perform Data Definition Language(DDL) operations on the database objects. 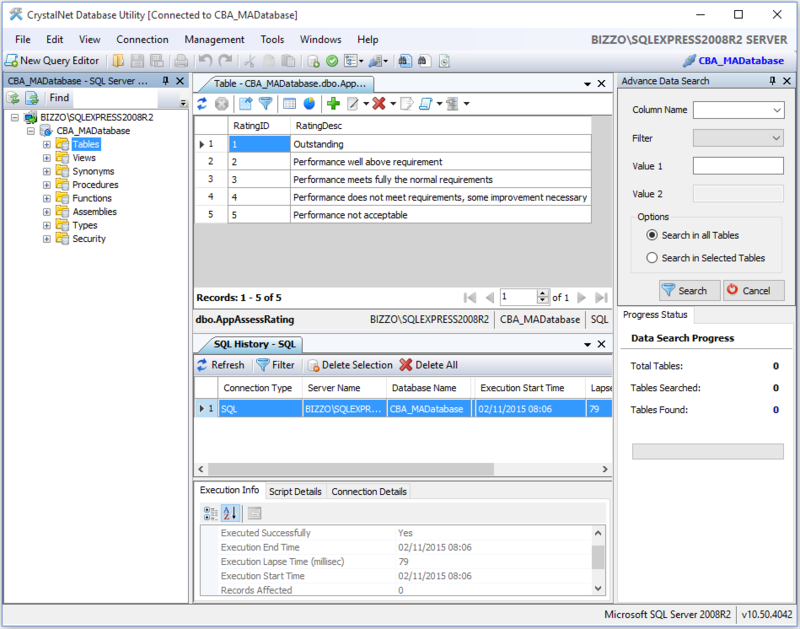 The DDL operations performed using this wizard include: ALTER, CREATE and DROP objects. CrystalDB Tool allows the user to create packages that import and export data between databases from different servers (MSSQL and Oracle), the same servers, spreadsheets, text files and XML Files. CrystalDB Tool allows the user to compare the structure or the data in two databases both from the same server or different servers. CrystalDB Tool allows the user to view XML data from an xml file, excel file and any file which contains xml format and add a new xml data. CrystalDB Tool provides an easy way to develop database queries by using a point-and-click interface and does not require in-depth knowledge about the SQL syntax. - Management of Databases, tables, views, triggers, synonyms, functions, procedures, etc. - Improved analysis of comparison results. - Stability and performance improvements. - Usability improvements. Database Tool, SQL Server, Oracle, CrystalDB Tool, Compare Data, Compare Schemas, Query Builder, Query Editor, Generate Script, Import Data, Export Data, Oracle Client, Switch Oracle Client, Restore Database, Backup Database, Database Management This is a Microsoft Windows based database tool developed for managing, administering and developing databases. This tool supports the two most common database management system, which are Microsoft SQL Server and Oracle.